Not all fights predicted to be barnburners actually live up to that billing but last night at Home Depot Center in Carson, California, WBA lightweight champion Brandon Rios and challenger Urbano Antillon produced a short but thrilling war of non-stop action. Both combatants had made their careers on forcing opponents to fight backing up and each had vowed going into last evening's clash that they would not take a backward step. The first round saw those promises kept as Rios and Antillon continued the animosity displayed during the pre-fight media buildup, immediately going head to head and crashing in big shots from the first bell. Antillon looked to have the faster hands but the more compact style of Rios seemed to leave the champion less open to the numerous punches that were flying all over the place. 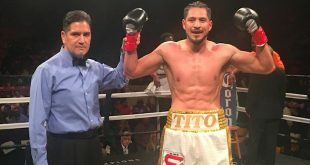 By the midway point of the first, Rios seemed the stronger man and was landing the more telling shots, setting up the challenger with a hard jab before whipping in a rain of hurtful right hands and uppercuts that rattled Antillon. But the challenger dug in deep and refused to bend, answering back with a torrent of hooks to the head and body that halted the momentum of Rios. Near the end of the first Rios regained control behind a series of strong uppercuts. 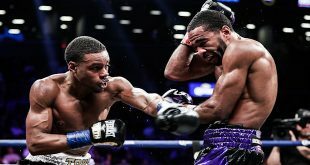 The opening moments of the second saw the pair opt for a bit of distance as they began the round boxing, with each fighter scoring with most everything that was thrown. Rios began to back up Antillon, mixing in left hooks to the liver but the challenger fought his way off the ropes and back to center ring. The fight went back inside as Rios took advantage of a temporary lack of punching from Antillon, landing uppercuts and hooks. Antillon sprang back with a sequence of left hooks that were all blocked but he did get in a hard uppercut and a few follow up hooks. Rios answered back with a few hooks and uppercuts as they were back going head to head. This was trench warfare with short punches flying from each fighter as they struggled to gain control. Antillon dug in with hooks to the body until Rios backed him off with a series of left hands. They began to box again and Rios had Antillon backing up behind a series of scoring jabs and crosses. Antillon got back inside and the two traded big hooks with abandon. Antillon suddenly came up with a hard right that had Rios backing up as the second came to a close and the fighters had to be separated by referee David Mendoza. 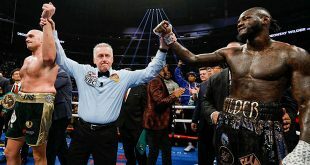 The third started with a renewed fury with each man throwing defense to the wind until twenty seconds into the frame Rios caught Antillon with a massive right that dropped the challenger to the canvas. Antillon made it up with no difficulty after a few seconds but was immediately put under pressure on the ropes by Rios, who was letting both hands go in an attempt to finish off his rival. While Antillon wasn't throwing anything back, he expertly bobbed and weaved his way out of trouble and off the ropes. The challenger resumed going head to head with Rios but shortly backed off and onto the ropes where he was getting hit with left hooks. Antillon fired back and was catching Rios but also taking punishment in return with the champion looking fresher as Antillon was now trying to clinch his way out of trouble. Rios put Antillon on the ropes and was landing hooks and uppercuts before Antillon started to return fire but the challenger appeared to be weakening. The fighters stood head to head in center ring and traded blows until Rios caught the challenger with a right and Antillon fell onto the canvas. Antillon again beat the count but this time was clearly in rough shape. As Rios came in to finish the job, a shaky Antillon grabbed hold and had to be pried off by the referee. Rios almost fell over on his own, held up by the ropes as he struggled to keep on his feet. Rios ran over to Antillon after seeing this but was grabbed by the referee, who waved off the fight with ten seconds remaining in the third. Rios, 28-0-1 (21), retains the WBA title for the first time while Antillon, 28-3 (20), has now lost two straight, both world title bouts. The undercard featured yet another upset by spoiler Carlos Molina, 19-4-2 (6), who forced former welterweight champion Kermit Cintron, 32-4-1 (28), into a bruising close quarters street fight over ten rounds. Molina negated his height and reach disadvantage by getting on the inside and forcing Cintron to wrestle and slug in a very small space, something his long-armed frame is not suited for. Cintron, a big puncher at welter, caught Molina coming in at times with good punches, particularly in the sixth and seventh frames, but the shots had very little effect on his durable opponent. After ten rounds, Molina swept all three scorecards by a 98-92 margin.